Taking a tour to the top of the Mackinac Bridge? That’s always a good story. Getting engaged on the Mackinac Bridge? Now that’s a tale that future generations will hear. That’s just what happened to Emily Misner and her boyfriend, Cord Wilson (now fiancé; she said yes! ), who proposed to her midday Wednesday. The couple were at the bridge for a tower tour Misner won in the #MightyMacWalk17 social media photo contest offered by the Michigan Department of Transportation (MDOT) and the Mackinac Bridge Authority (MBA). Misner said that after she made her way up the final ladder and onto the tower top, Wilson called her name to get her attention and then got down on one knee to pop the question. For his part, Wilson said he’s known about the upcoming tour for a few months and planned the proposal for about a month. Misner and Wilson, both St. Ignace natives, have been together for a little more than four years. She has a daughter (who just turned 11 today, and apparently was in on the surprise) and works at Belonga Plumbing and Heating, and he runs towing and is a technician at George’s Body Shop. MDOT Photographer Sara Martin tagged along to document the tour and was able to provide photos of the proposal as well. Quite a coincidence: Martin’s husband, Nick, proposed to her during a similar tour in July 2007. Of course, there is huge interest in tours of the Mackinac Bridge, and the MBA provides some limited opportunities outside of the Annual Bridge Walk social media contest that Misner won. The MBA holds a Tower Tour drawing once per year each August, and randomly chooses 25 non-profit organizations to receive a tower tour certificate to be raffled or auctioned for charitable purposes. The certificates can be used between May 1 and Oct. 15 the following year and are good for two people. 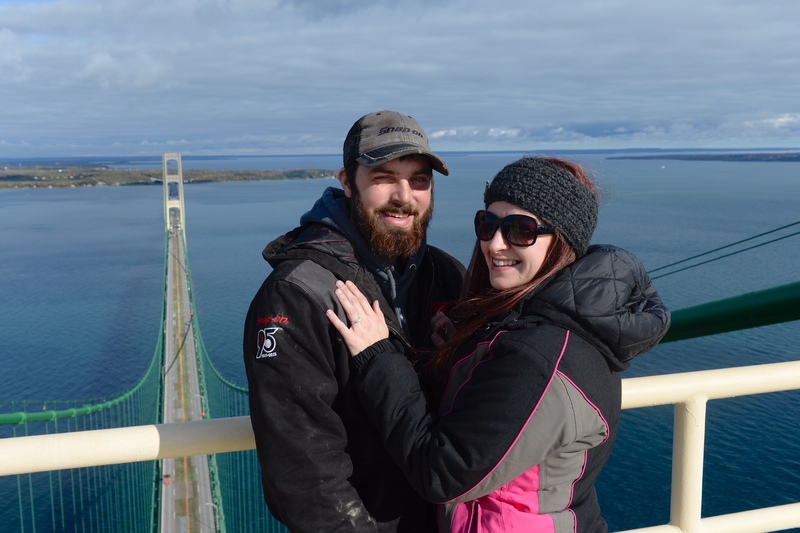 Cord Wilson and Emily Misner got engaged on top of the Mackinac Bridge. Wilson popped the question during a tower tour Misner won in the #MightyMacWalk17 social media contest. 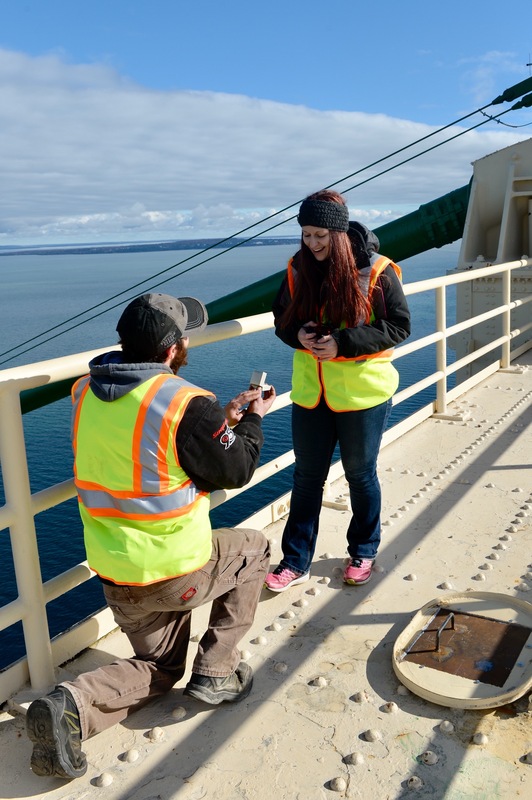 Cord Wilson proposes to Emily Misner on top of the Mackinac Bridge. Misner won a tour for the couple in the #MightyMacWalk17 social media contest.